There are many delicious Dutch delights which must be tried at least once. Here’s a list of 10 foods you should be sure to sample! This is Part I in our Dutch Food series. Netherlands foods may not be as well-known as French or Chinese cuisines but there are many Dutch delights which must be tried at least once. 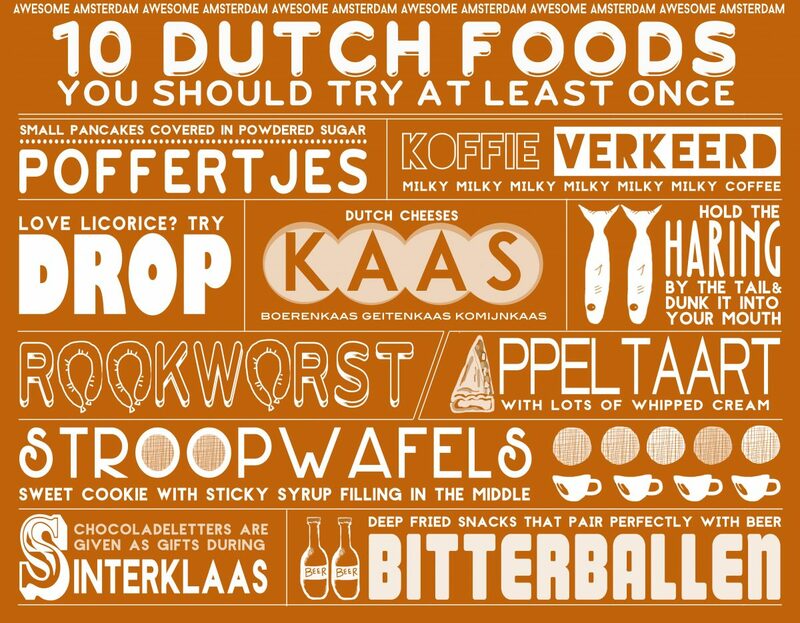 If you enjoy this list, check out the next editions: 10 More Dutch Foods to Try, Part II in our Dutch Food series. And don’t miss Part III as well to learn all about the Netherlands cuisine. And definitely do not miss these 7 Dutch Drinks You Should Be Sure to Sample. Poffertjes are small, fluffy pancakes made with yeast and buckwheat flour. These tasty treats are prepared using a special pan with several shallow indentations in the bottom to hold the batter and make perfectly puffed small pancakes. Poffertjes are typically served topped with powdered sugar and butter. Poffertjes are a traditional Dutch food consumed in fall and winter when stands selling the delicious snack can be found at outdoor markets and on many street corners. They are usually served on a little paper plate with a tiny fork for smearing the butter and stabbing the cakes to ferry into your mouth. The wind blowing the powdered sugar around covering your face and clothing in white dust is part of the fun! The pancakes are sometimes eaten with other sweet toppings, such as stroop (syrup), slagroom (whipped cream) or aardbeien (strawberries). 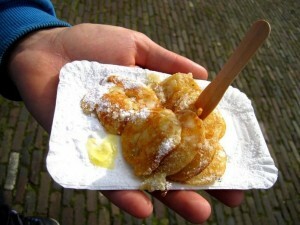 In Amsterdam you can try poffertjes at lots of festivals, especially in the wintertime. Look for them at ice skating rinks and food festivals like the Sunday Market, Pure Markt and Rollende Keukens. Take a look at our agenda to see what is on in town right now! 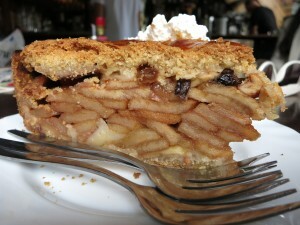 Have you heard the saying “as American as apple pie”? Well, it turns out that apple pie is actually about as Dutch as it gets. Traditional Dutch appeltaart has a sweet cakey dough on the bottom and edges, with a lattice on the top. The apple slices in the filling are flavored with cinnamon, sugar and lemon juice. Common apple varieties called for in appeltaart recipes are Elstar, Gala and Goudreinet as they are crispy and not too sweet. Many Amsterdammers say the tastiest appletaart is found at Winkel or Papeneiland, both in the Jordaan near the Noorderkerk. Served with a dollop of whipped cream, their pie surely is sweet and tasty. Winkel and Papeneiland both likely sell thousands of slices each Saturday when the bustling Noordermarkt farmers market takes place on their doorsteps. 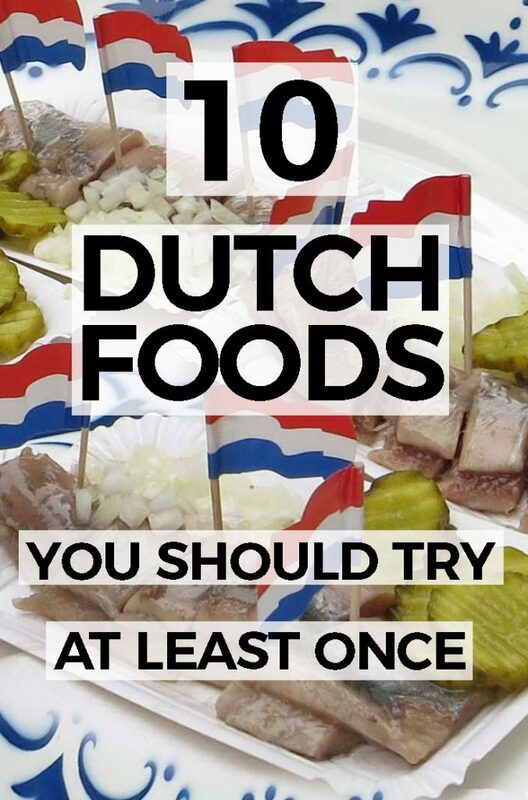 Be sure to try this famous Dutch food. Want to make appeltaart at home? It’s easy. Check out this cookbook with traditional Dutch recipes. These savory orbs are battered in a crunchy breadcrumb coating and filled with a gooey mixture of chopped beef, beef broth, flour, butter, herbs and spices. They are typically served with mustard for dipping. If you’ve never tasted bitterballen before, order them at a cafe as the perfect accompaniment to a round of beers. But be careful when you bite through the crunchy crust, the meaty ragout filling is often burning hot! Let op! You can sample bitterballen at almost any bruincafe in Amsterdam, those at Grandcafé Luxembourg are said to be the best. If you are vegetarian, be sure to get the veggie bitterballen at places like Cafe de Ceuvel. And if you want to sample something really interesting, try the Schipholgans bitterballen at MOES Amsterdam. The place with the widest variety of bitterballen (like chorizo, goat cheese or truffle) is definitely De Ballenbar at De Foodhallen! A cousin to the bitterbal is the bigger, oblong shaped kroket. It is often enjoyed as a sandwich on a soft bun and you can get it at the famous food from the wall spots in Amsterdam like FEBO and Smullers. 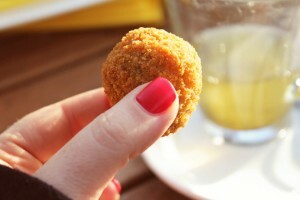 Bitterballen and kroket are some of the most famous Dutch foods, so you simply must sample them! 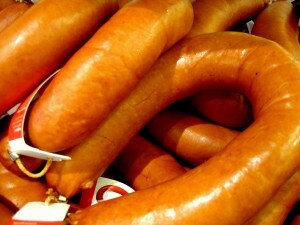 Rookworst is a product made of ground meat mixed with spices and salt and is often served with dishes such as stamppot. Originally, the casing was made from natural gut membranes, but nowadays bovine collagen is often used. Today, this sausage is rarely smoked, rather it is produced in factories where smoke flavor is used. But the real rookworst is made in a smoke house using fresh wood chips. Be sure to try it if you can find it! Rookworst is widely available in many supermarkets and butchers as it is very common in Dutch cuisine. The quest for the best rookworst in Amsterdam has led to Slagerij Vet in De Wallen. The version at HEMA is probably the most ubiquitous and the store even has toys and decor items featuring this popular sausage. A delicious chewy cookie, the stroopwafel (syrup waffle) was first made in the town of Gouda in the Netherlands during the 18th century. In fact, until 1870 stroopwafels were made only in Gouda and there were about 100 bakeries selling these treats in that city alone. This sweet snack is a waffle cookie made from two thin layers of batter with a sticky syrup filling in the middle. 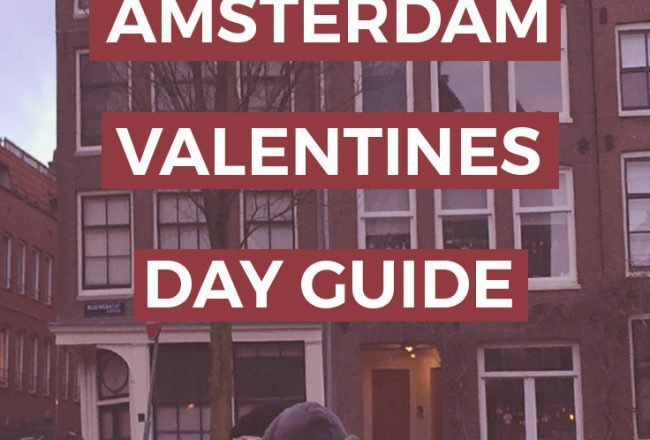 They can be purchased in packages at nearly every grocery store and bakery in the Netherlands, as well as freshly made at street stands at markets and festivals. In Amsterdam you can find freshly made stroopwafels at Amsterdam street markets like Albert Cuypmarkt and Noordermarkt. Stroopwafels are particularly good with a cup of coffee or tea. The cookies come in various sizes, but the most common diameter fits perfectly as a lid on a cup of hot liquid. This softens the cookie and melts the sweet syrup, making a delightful dessert or snack. Not in the Netherlands? You can find stroopwafels online! Visit any cafe or restaurant in the Netherlands and you are sure to notice someone ordering a koffie verkeerd. 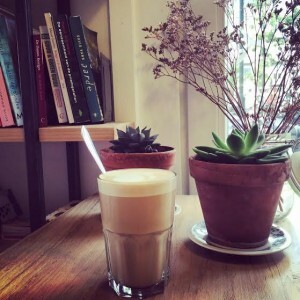 This is the Dutch version of a caffè latte or café au lait. It is traditionally a hot cup of coffee with a lot of warm milk, but is most commonly served as an espresso with a lot of steamed milk and some frothy foam. If you like milk in your coffee, order a koffie verkeerd with your breakfast or as an afternoon treat. Many people add a cube of sugar to their koffie verkeerd and stir it up with a little spoon. The Dutch almost always serve a little cookie with your coffee, which is a charming addition to this milky caffeinated delight. You can order a koffie verkeerd at almost any cafe or restaurant in the Netherlands, in Amsterdam we like ours best in a cozy cafe on a rainy day. Be sure to check out these other 6 Dutch drinks you should try too! A very traditional Dutch food in the Netherlands, Hollandse nieuwe haring should be tried at least once. The raw herring fish is typically served with chopped onions, and can be eaten with or without bread. 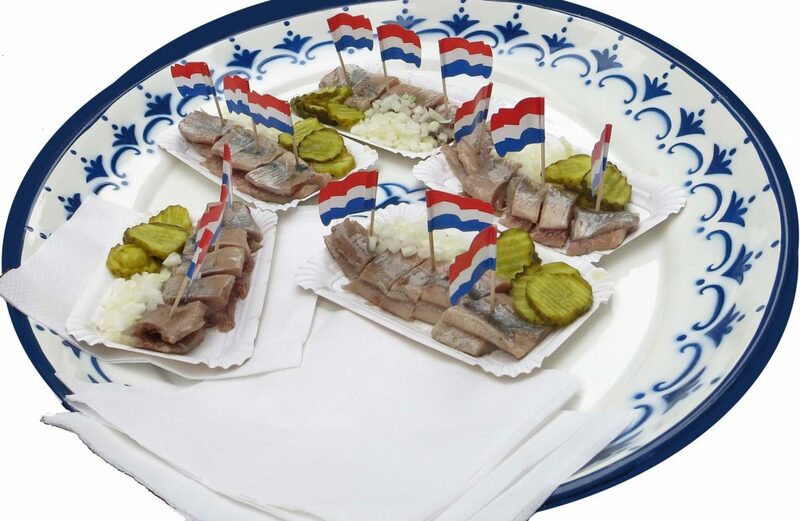 Herring should only be called Hollandse nieuwe if caught between May and July. The fish should also be prepared according to the Dutch tradition where the freshly caught fish are gutted onboard the fishing boats, leaving the pancreas in the fish. The pancreatic enzymes perform much of the preservation of the haring, so that the brine they are kept in needs less salt. Dutch herring are traditionally eaten by holding the fish by the tail and dunking it into your mouth with your head thrown back. If that doesn’t seem appealing, haring can also be eaten in bite size pieces or on a sandwich called broodje haring. You can find haring at street stands and shops all around Amsterdam. Just look for the Dutch flag! Check out this walking or cycling route that will take you past several haring shops. You might not like licorice or smoked eel, but creamy, nutty cheese sounds delicious, right? Most people are familiar with what is called “Gouda cheese”, in fact cheese.com says it is the most commonly eaten cheese in the world! By the way, Gouda is not pronounced “gooo-dah”, but rather with the Dutch hard G as something like “how-dah” or “howd-suh kahs” (Goudse kaas = cheese from Gouda). Did you know that Gouda cheese or Goudse kaas is named after the city of Gouda but is not actually made there? It got the moniker because farmers brought their cheeses to the Gouda markets to sell and trade. The name Gouda cheese is not legally protected and therefore this style of cheese can be made worldwide even though it is a typical Dutch food. In the Netherlands, this style of cow’s milk cheese is extremely common. The cheeses are classified by how long they are aged. Jonge kaas is the youngest with about a month of aging, while older Oude kaas or Overjarige kaas is aged for a year or more and develops a tangy caramel flavor. Slices of young cheese are commonly used as sandwich toppings, while the aged versions are often eaten as a snack with drinks. The cheeses are really delicious with beer or wine, and most bars around Amsterdam serve them. Try it! 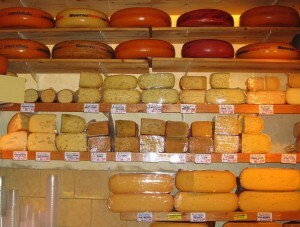 A popular brand of aged Gouda is Old Amsterdam and can be found throughout the Netherlands as well as in grocers like Trader Joes in the USA, or online. When you are in Amsterdam look for cheese shops like De Kaaskamer van Amsterdam to sample these delicious dairy delights. The chocoladeletter is a Dutch candy made ​​of chocolate in the form of a letter. 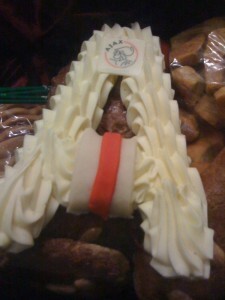 It is a fun delicacy that is most often sold around the time of Sinterklaas celebrations in the Netherlands. The history of the chocoladeletter begins in the middle ages when letters were created from bread dough as a traditional Dutch food treat for children. This continued throughout the centuries until the letters were commonly made from chocolate in the 19th century. Chocoladeletters are given as gifts at Sinterklaas, the Dutch celebration of Sint Nicolaas in early December. The letters are usually chosen for the recipient’s first name. M is said to be the best selling letter because many Dutch first names (Martijn, Marieke, Marleen, Matthias, Menno, Michelle) and Moeder (mother) begin with M.
The tasty treats may be given as gifts to friends, family or employees or left as a surprise in your shoe by Sint Nicolaas during the night of Sinterklaas. Most candy companies don’t make Q, U, Y, or Z as very few Dutch names begin with these letters. The M and W letters look the largest, though all letters weigh the same amount. Chocoladeletters come in white, milk or dark chocolate. We recommend the slave-free chocoladeletters from Tony’s Chocolonely. Please keep in mind that I like milk chocolate and my name begins with S. Bedankt. Drop is the Dutch word for licorice, and the Netherlands truly loves this dark colored candy snack. With the highest per capita consumption of licorice in the world, each person in the Netherlands eats more than 4 pounds (2000 grams) per year on average! You can find several varieties of drop in nearly every shop from Albert Heijn to Hema, as well as the ubiquitous Jamin candy shop. There is a flavor or type of drop for every taste from sweet to salty, hard to soft. Drop comes in many shapes and sizes from small Groente Erwten (green peas) to large Muntdrop chewy coins. 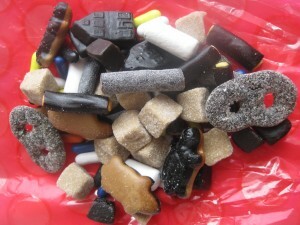 Other than the Dutch, Germans and Scandinavians, many people do not enjoy the taste of black licorice, especially the salty varieties called salmiak. If you’re on the fence about drop, try the cute Apekoppen (monkey heads) which combine chewy sweet licorice and soft banana candy – they’re my favorite! You can find Dutch drop online too! 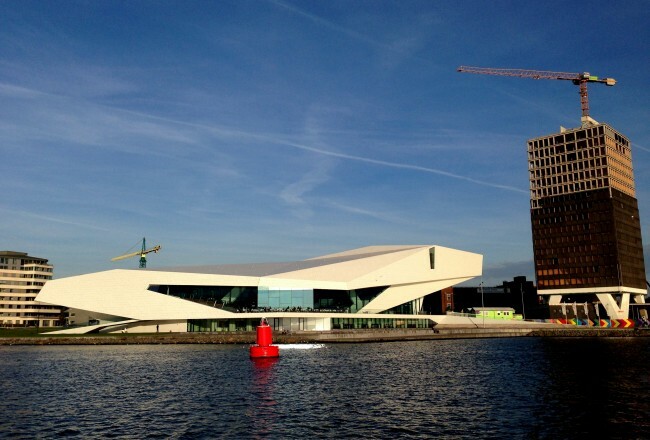 To learn more about the Netherlands’ love for drop, check out our article What’s the Deal with Drop? 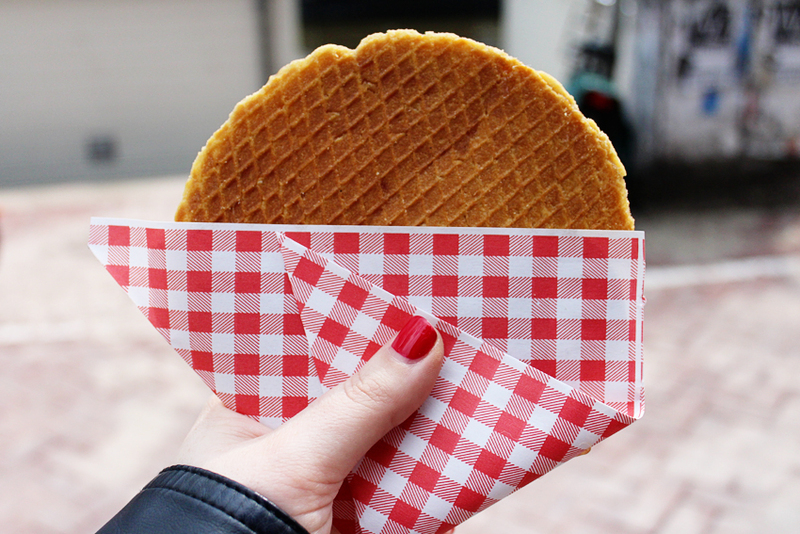 That concludes our list of 10 Dutch foods you should try. But there’s MORE! Check out 10 More Dutch Foods to Try! It’s Part II in our Dutch Food series. And don’t miss Part III as well! Eet smakelijk! Definitely do not miss these 7 Dutch Drinks You Should Be Sure to Sample. 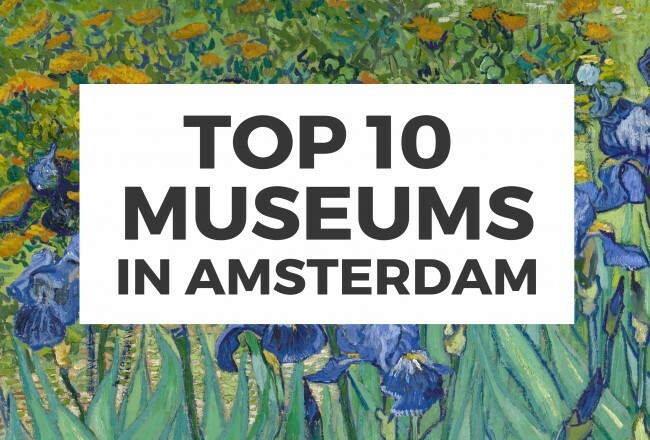 Are you in Amsterdam? Why not try all these Dutch foods on a short bicycle or walking tour around the city?